On 2/12/14, Asulia will be at Le Cordon Bleu for Mass Innovation Night’s MINfoodie 6 event. The four food startups with the most votes will also have a chance to present at the event. I’d appreciate your vote to be among the four to be able to share more with the attendees. Please cast your vote for Asulia Foods here from all your devices. Thank you! Back in 2012, after I was laid off from my job, I seriously considered going to culinary school, since I love food and cooking. I couldn’t have imagined that I’d be going to Le Cordon Bleu in such a different way! 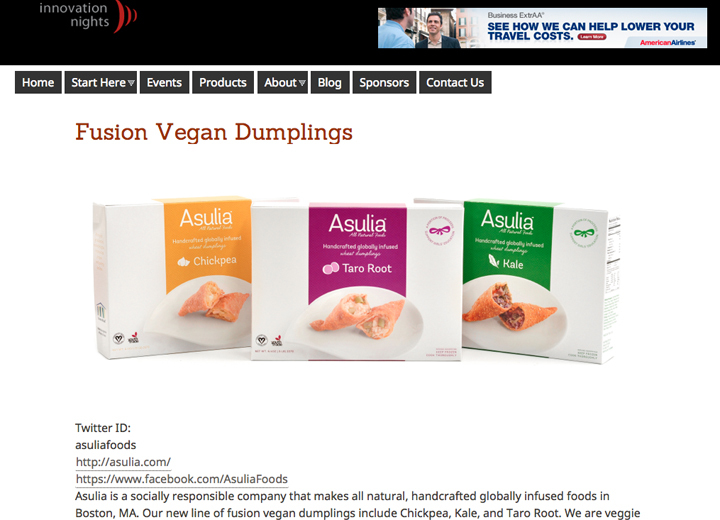 The Asulia team will be giving out free samples of our vegan chickpea, kale, and taro root dumplings. The MINfoodie 6 event is free and open to the public. Support local innovation! Please RSVP to the event so we can better prepare. The culinary school is graciously hosting the event along with Mass Innovation Nights and the Canadian Consulate is kindly sponsoring the evening. Hope to see you at Le Cordon Bleu! You can find more events here. Join us on our food startup journey by subscribing to our e-news, like us on Facebook, follow along on Instagram, Twitter, and Pinterest. We still have a long way to go as a startup. Thanks so much for the kind words Greg!